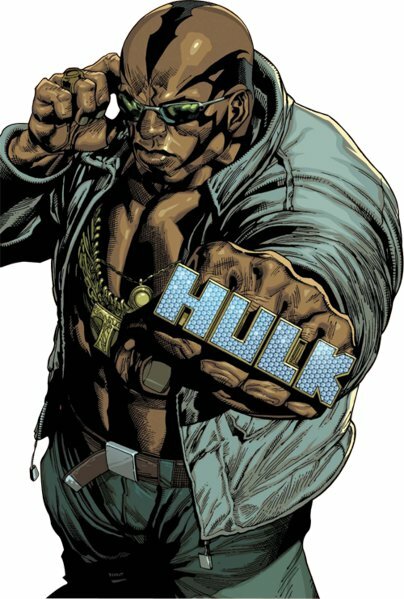 Powers: He has all the powers of hulk but maintains his intellect and identity. Tyrone was the mentor of Bruce Banner in earth 1610 (ultimate universe) they worked on the super soldier formula. Leo was reliant on crutches to get around in life and subjected himself and others to his experiments. While everyone else died he survived and became the first hulk. He was soon thought dead but in truth escaped with his new far more powerful body [Ultimate Comics: Avengers #7]. He settled in south America where he took on the identity of Tyrone Cash and took over the local drug cartels and lived as king. Years later War Machine would seek to recruit him into the Avengers. He only agreed when they threatened to tell his wife and son what had really happened to him[Ultimate Comics: Avengers #8]. His nationality is British. He was apart of the European Super-Soldier program.and it was Nick Fury himself who smoked him after a full 24 hours went by to ensure the “Hulk drugs” were out of his system and not before securing some of the hulk drugs for himself and his crew. Why is damn near every black character’s first name Tyrone and/or last name Williams? This is one of the reasons they need to leave ethnic characters to ethnic creators. Your right Randall, and don’t forget the name Lucas! I hated this character so much. In fact, almost everything from the era he was in was not good at all.The Ultimates and Ultimate Avengers were poor reflections of the original stories, almost like fanfiction based on the older material, filled with terrible shock value rather than creative development. “Black Hulk”, “Nerd Hulk”, and the terrible vampire story arc were why I gave up on them. Besides Miles Morales as Ultimate Spider-Man, the Ultimate line has been terrible since Ultimatum.